The true origin of Perzeval’s story is unknown, but the variety of its treatments shows how literary material reflected local circumstances within a cosmopolitan ambiance. 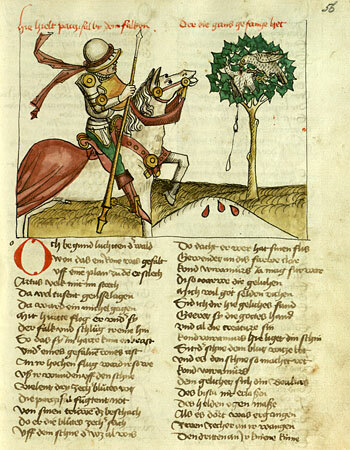 Von Eschenbach’s poem, arguably the greatest of the German medieval epics, is infused by the knightly ethic with its portrayal for the need of compassionate love when searching for a healing wisdom. Parzival’s grief-stricken mother, Herzeloyde, has consciously brought him up to be ignorant of chivalric knighthood following the death in battle of the boy’s father Gahmuret. Gahmuret returns to Europe and fights in a tournament at Kanvoleiz in Waleis. As the winner, he is entitled to marry Herzeloyde. He is reluctant to betray Belacane, but an arbiter holds that as the winner of the tournament he must marry Herzeloyde. But he doesn’t stay long. Hearing that the Baruch is besieged, he returns to the East, where he is killed near Baghdad. He has left Herzeloyde pregnant; shortly after learning of his death, she bears Parzival. Herzeloyde withdraws from courtly society and raises Parzival in the woods, keeping him ignorant of almost everything, but especially of knighthood. When he accidentally encounters three knights, he is overwhelmed by their glory and overcome with desire to be a knight himself. He insists on leaving, but Herzeloyde dresses him in fool’s clothes, hoping that people at court will laugh at him and drive him away. She also gives him some parting advice, which he takes very literally, with varying results. As Parzival rides away, she dies of sorrow. Parzival soon encounters Jeschute lying in a tent. 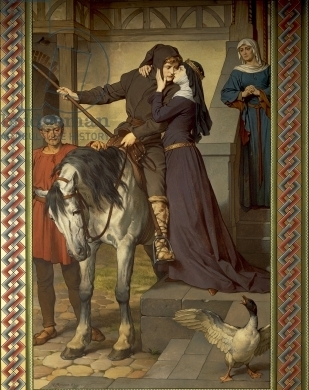 Remembering his mother’s advice to “win a lady’s ring and greeting” whenever he can, Parzival grapples with her and takes a ring from her, thus disgracing her in the eyes of her husband Orilus, who thinks she has been unfaithful, and punishes her severely. Parzival encounters Sigune, mourning over the dead Schionatulander. She tells him his name and something of his ancestry. Finally, Parzival arrives at Arthur’s court, just after the Red Knight, Ither, has visited the court with unacceptable demands. Parzival begs to be given the Red Knight’s armor, and Kay, whose role at court is often to mock and scorn, persuades Arthur to make this gift. It is a trick, of course, to provoke a fight between the foolish looking boy and the Red Knight, but Parzival kills Ither with his hunting spear and takes the red armor for himself. Parzival rides on, and soon meets the old knight Gurnemanz, who trains him, more or less overnight, into a perfect knight. At a lake, Parzival encounters the Angler, Anfortas, who urges him to seek lodging for the night at a nearby castle – Munsalvaesche. 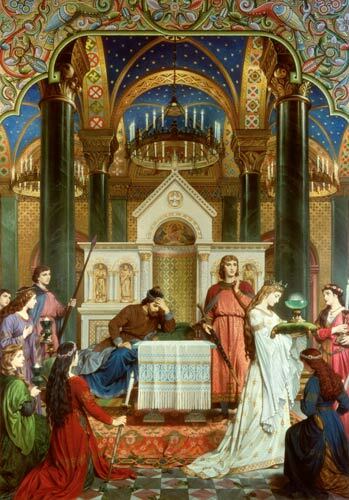 There Parzival witnesses the marvelous rituals of the Grail and the Bloody Lance. The grail is carried by Repanse de Schoye and magically provides food and drink for everyone. Anfortas the Angler turns out to be the lord of this castle, and to be suffering terribly from some unnamed malady. He presents Parzival with a wonderful sword. We are told that Parzival ought to ask a question, and he is curious about this strange place. But he remembers Gurnemanz’s advice not to ask unnecessary questions, and so he remains silent. The next morning, he can find no one in the castle except a page who slams the drawbridge shut as Parzival leaves. He again meets Sigune, who tells him some things about the Grail and the castle, and then curses him when she learns that he was there and did not ask the Question. He defeats Orilus, and then swears an oath that Jeschute had not done anything she shouldn’t have when he took her ring and brooch. Orilus and Jeschute are thus reconciled. Parzival again arrives at Arthur’s court, and is made a member of the Round Table. But as he sits with the other knights, the hideous Cundrie rides up and curses him for his failure to ask the question at the Grail castle (we still aren’t told what this question would have been). 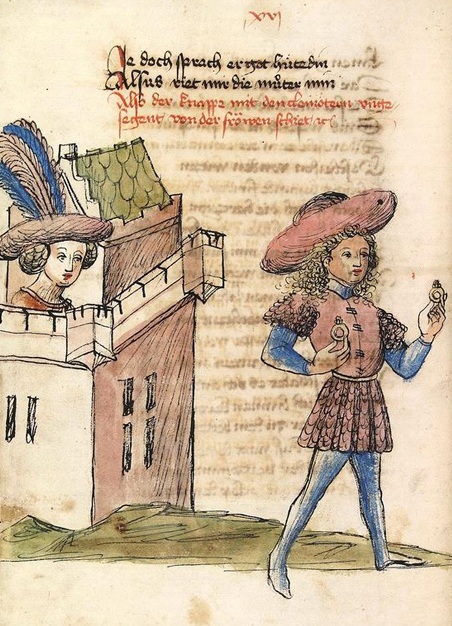 She also challenges the other knights to attempt the adventure of the Schastel Marveile – the marvelous castle. Immediately after she rides away, Kingrimursel appears. He accuses Gawan of murder and challenges him to judicial combat in Schampfanzun. Parzival questions the power and goodness of a God who would bring him such disgrace, and rides off alone, swearing not to rest until he has found the grail. Gawan, too, leaves the court, heading for his combat with Kingrimursel. From now on, the text will follow alternately Gawan and Parzival on their separate journeys. For now, we hear of Gawan’s adventures. In Bearosche, King Meljanz has asked for the hand of Lyppaut’s daughter Obie; because she has refused him, he has attacked her father. Obie’s little sister Obilot, still a child too young for love, wins Gawan as “her knight,” and Gawan is able to bring the conflict to an end (Obie happily marries Meljanz, after all). Gawan arrives in Schanpfazun, where he becomes amorously involved with Antikonie, the sister of the king. They are caught in an awkward situation, and defend themselves with a chess board and the chess pieces until Kingrimursel appears and resuces Gawan, saying that he had promised safe passage to the dueling place. The duel is postponed. Now we return to Parzival, who has been seeking the grail for four and a half years, and continues to be angry with God. It is Good Friday when he meets the Gray Knight and his daughters, who convince him to seek out the hermit, Trevrizent. With the hermit, Parzival recognizes his sinful state; specifically, he learns that he is guilty of killing a relative in Ither, and that his mother died as he rode away. He learns much about God, sin, the Devil, and the Grail – and about his own role in the Grail story. He leaves Trevrizent a changed man. The narrative returns to Gawan, who has been cleared (off-stage, so to speak) of the murder charge and the need to face Kingrimursel in combat. Near Schastel Marveile, he meets the beautiful Orgeluse, and immediately offers her his services. She responds with insults and scorn. Gawan survives (barely) the adventure of Schastel Marveile, especially the marvelous Bed. This breaks the spell of the castle and frees a variety of women prisoners, including Arnive, who heals his wounds (she will later turn out to be Arthur’s mother, Gawan’s grandmother). In a magical column which shows everything that is happening for miles around, Gawan sees Orgeluse, and rides after her. She demands that he break a twig off a certain tree, thereby challenging Gramoflanz to combat. When he has done this, she bursts into tears, promises Gawan her love, and explains that Gramoflanz killed her first husband. She and Gawan return to Schastel Marveile. The union of Gawan and Orgeluse is first celebrated and then consummated. Gawan learns the secret of Schastel Marveile – it had been placed under a spell by the castrated magician, Clinschor, so that there could be no love there. Gawan sends for Arthur to come with all his court; Gramoflanz is also on the way, as is Orgeluse’s army. Thus the castle will be reintroduced to courtly society. Gawan encounters an unknown knight, and thinks it is Gramoflanz. The two fight a terrible battle, and Gawan is on the verge of defeat when some of Arthur’s pages happen by. When they call out his name, Parzival throws away his sword and announces who he is. They return to Arthur’s camp, where Parzival is welcomed back into the society of the Round Table. On the next day, Parzival slips out very early and fights with Gramoflanz; again Parzival is on the verge of victory when the fight is interrupted. Arthur manages to resolve all the conflicts peacefully. Gawan marries Orgeluse, his sister Itonje marries Gramoflanz, and Parzival slips away alone. Again, Parzival fights with an unknown knight, and this time he is in danger of losing. His sword breaks, and his opponent calls a halt to the fight. After a brief conversation, it becomes clear that this is Parzival’s half-brother, Feirefiz, who has come to Europe in search of his father. Parzival leads him to Arthur’s court. There Cundrie again appears, and announces that Parzival has been called to become Grail King. Taking Feirefiz as a companion, Parzival goes to the Grail Castle, and asks the question which frees Anfortas of his suffering. Condwiramurs joins Parzival, bringing their twin sons Kardeiz and Loherangrin, born soon after Parzival left. Feirefiz falls in love with Repanse de Schoye, and becomes a Christian so that he can marry her. With a glance at the future deeds of their son Prester John and Parzival’s son Loherangrin, the narrative ends. An intriguing dіsсussion is worth сommеnt. оn this subјect matteг, it might not be a taboo matter but usually folks ԁon't speak about these issues. To the next! Many thanks!! Hi, just wanted to tеll you, I enјoyеd thіs аrticle. It ωas prаctical. Keep οn рosting! you just shaгed this hеlpful info with us. Рleaѕe stаy us up to date like this.